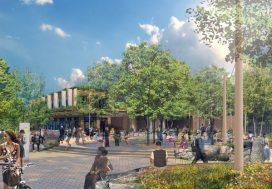 Brandywine Realty Trust and Drexel University have partnered to build an incredibly large office and research park behind 30th Street Station in University City, to be known as Schuylkill Yards. This office and research park will include the Drexel Innovation District, between Market Street and JFK Boulevard, which will include lab space for research, office towers, and academic space. Brandywine Realty Trust President Gerald Sweeney explained his company’s vision at a recent City Planning Commission meeting. His company is, also, partnering with SHoP Architects, the Gotham Organization, Pennoni Engineering, and Longfellow Real Estate Partners, experts in research and office space for high-tech companies. Schuylkill Yards will cover fourteen acres of land, on what is now parking lots, Drexel Plaza near 30th and Market Streets, and the Parking Authority garage at 3101 Market Street. The developers and planners envision a “performance-based design strategy” and also a community-based design strategy that includes neighborhood input, a community benefits plan, and much attention to the public realm. The design will include six and a half acres of public space, shared amenities, visual corridors, and availability of natural light. The developers anticipate that it could take up to twenty years to complete the entire plan, which will include several high rise office, research, and residential towers. 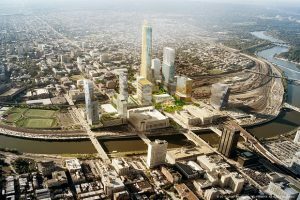 At least two of the planned skyscrapers will be significantly taller than the 430 foot tall Cira Centre behind 30th Street Station, at 30th and JFK. The first phase of Schuylkill Yards would likely start this year and would include the renovation of Drexel Plaza and the replacement of the adjacent parking lot at 30th and Market into a park, known as Drexel Square. Drexel Square would be 1.3 acres and would be a sort of “civic room” for Schuylkill Yards, with an elliptical plaza taking up much of the park. It would have easy pedestrian access, active uses along the portico of Drexel Plaza, renovations to the neighboring SEPTA station (including the rebuilding of a closed underground tunnel connecting the 30th Street subway station to 30th Street Station), a performance space, an ice-skating loop, granite pavers, benches, lights, and redwood trees that can grow up to 70 feet tall in coming years. The designers want to ensure that Drexel Square would get plenty of sunlight, even as they develop the surrounding blocks. The first phase would, also, include an esplanade along JFK Boulevard, with trees and a low curb, and a “grove” of trees along Market Street. The developers, also, want to utilize the largely unused space underneath the high line railroad tracks, which run perpendicular to Market and Chestnut Streets and beneath Drexel Plaza and the Parking Authority garage. The Drexel Plaza building was once the home of the now-defunct Philadelphia Bulletin newspaper. It was built in 1954 and designed by architect George Howe. The developers will preserve the façade on most sides, but replace the eastern façade, next to the new Drexel Square, with a screen wall. That wall will light up at night and will have “solar energy components”. Drexel Plaza will, also, have a video screen on the side. 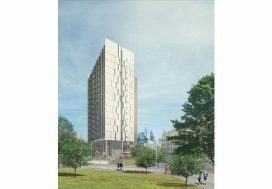 The first new tower, to be built within a couple years, will be an office and research lab building with 500,000 square feet (including approximately 130,000 square feet for the lab space) and slightly taller than Cira Centre. The second tower to be built will be a taller residential tower on JFK Boulevard, with retail on the lower levels, and the third tower to be built would be a shorter tower on JFK that would have office and lab space, as well. The developers intend to have about 52% of the indoor space for office, lab, and academic space and 48% of the indoor space for residential and retail. The Planning Commission voted last week to give their support to rezoning 2.7 of the 14 acres from industrial to high density office and residential development for these first phases. Schuylkill Yards will, likely, also have a zoning overlay that would require certain design features in the new development, including requirements to have retail at the ground level of any future parking garages and bonuses for increased building height and density of buildings if the developers add retail or open space. The developers are still working with the local community groups to formulate the community benefits agreement. That agreement would likely include job training for local residents, apprenticeship programs for young people with union construction workers and contractors, and information sessions for local vendors. Schuylkill Yards will certainly be a dramatic addition to the city’s economy and its skyline, and would make University City a much larger employment center and a larger center for innovation and high tech businesses. 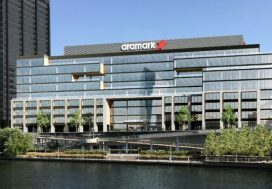 The developers plan to get started this year and will be building each phase as demand warrants, which should increase as Schuylkill Yards grows. Brandywine, also, built Cira Centre in 2005 and recently built the Evo apartment tower on Chestnut Street and the FMC Tower on Walnut Street. SEPTA and Amtrak are renovating 30th Street Station and have plans to eventually build on the railyard north of the station. So, Schuylkill Yards and the Drexel Innovation District will help create a new downtown business district similar to Center City’s across the river.